. 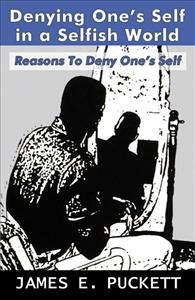 In this book I expose some problems with self, and with the help of the Holy Spirit, share some insights on why Christians must deny their selves. The world we live in today can be very demanding. “Come here, go there. Do this, and do that.” It never stops. It would be easy for one to just throw up his hands and say, “That is all I can take, from here on out it is all about me.” Every time we turn around life is asking something of us. If we are not careful we will live our lives with only one purpose in mind, that is, to meet the demands that selfishness can produce. Our nature is to first satisfy the flesh. In this book the author explains reasons why it is not healthy to live a life of selfishness, but to always have the needs and concerns of others in mind. In this book he expose some problems with self, and with the help of the Holy Spirit, share some insights on why Christians must deny their selves.